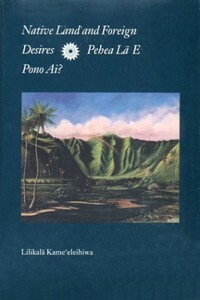 In Native Land and Foreign Desires: Pehea Lā E Pono Ai?, Lilikala Kame’eleihiwa, a rigorous scholar and an impassioned writer, presents the first detailed analysis of the Mahele from a contemporary Hawaiian perspective. Her fascinating account of this pivotal period in the history of Hawai’i is bound to stir public debate. Using Hawaiian language sources, Kame’eleihiwa analyzes the traditional Hawaiian relationship, both spiritual and political, to the land. She traces the changes in that relationship, through Christian conversion and American colonization, to explain how Hawaiian land was wrongfully taken from Chiefs as well as commoners. With an admirable commitment to her people’s future as well as past, Kame’eleihiwa follows in the illustrious tradition of the nineteenth century Hawaiian intellectuals David Malo, Jon Papa ‘I’i, and Samuel Kamakau. Her work, in turn, will provide historians of the twenty-first century with endless material for reflection and interpretation. 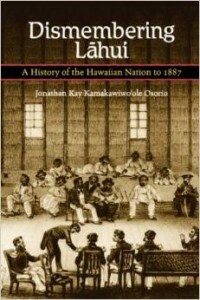 In Dismembering Lāhui, Osorio investigates the effects of Western law on the national identity of Native Hawaiians in this impressive political history of the Kingdom of Hawai’i from the onset of constitutional government in 1840 to the Bayonet Constitution of 1887, which effectively placed political power in the kingdom in the hands of white businessmen. 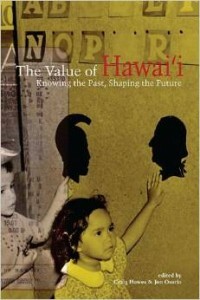 Making extensive use of legislative texts, contemporary newspapers, and important works by Hawaiian historians and others, Osorio plots the course of events that transformed Hawai’i from a traditional subsistence economy to a modern nation, taking into account the many individuals nearly forgotten by history who wrestled with each new political and social change. A final poignant chapter links past events with the struggle for Hawaiian sovereignty today. 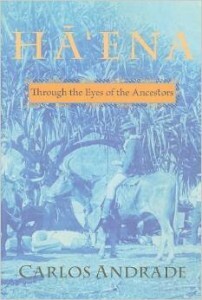 Ha’ena: Through the Eyes of the Ancestors is a distinctive work, which blends folklore, geography, history, and ethnography. It casts a wide net over information from earliest times to the present, primarily related from a Native perspective. It should be of great interest to historians, ethnologists, sociologists, and students of Hawaiian language, literature, and culture. Carlos Andrade begins by examining the stories that identify the origins and places of the earliest inhabitants of Ha’ena. The narrative outlines the unique relationships developed by Hawaiians with the environment and describes the system used to look after the land and the sea. Andrade goes on to research the changes wrought by concepts and perceptions introduced by European, American, and Asian immigrants. He delves into the impact of land privatization as Hawai’i struggled to preserve its independence. The Mahele and the Kuleana Act, legislation that laid the foundation for all landholding in Hawai’i, had a profound influence on Ha’ena. Part of this story includes a description of the thirty-nine Hawaiians who pooled their resources, bought the entire ahupua’a of Ha’ena, and held it in common from the late 1800s to 1967 – a little-known chapter in the fight to perpetuate traditional lifeways. Lastly, Andrade collects the stories of kupuna who share their experiences of life in Ha’ena and surrounding areas, capturing a way of life that is quickly disappearing beneath the rising tide of non-Native people who now inhabit the land. How did we get here? Three-and-a-half-day school weeks. Prisoners farmed out to the mainland. Tent camps for the migratory homeless. A blinkered dependence on tourism and the military for virtually all economic activity. The steady degradation of already degraded land. Contempt for anyone employed in education, health, and social service. An almost theological belief in the evil of taxes. At a time when new leaders will be elected, and new solutions need to be found, the contributors to The Value of Hawaii outline the causes of our current state and offer points of departure for a Hawaii-wide debate on our future. The brief essays address a wide range of topics education, the environment, Hawaiian issues, media, tourism, political culture, law, labor, economic planning, government, transportation, poverty but the contributors share a belief that taking stock of where we are right now, what we need to change, and what we need to remember is a challenge that all of us must meet. Written for a general audience, The Value of Hawaii provides a cluster of starting points for a larger community discussion of Hawaii that should extend beyond the choices of the ballot box this year. This revised version of From A Native Daughter includes material that builds on issues and concerns raised in the first edition. 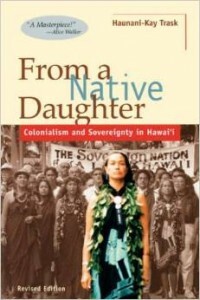 It explores issues of native Hawaiian student organizing at the University of Hawaii, the master plan of the native Hawaiian self-governing organization Ka Lahuni Hawaii and its platform on the four political arenas of sovereignty, the 1989 Hawaii declaration of the Hawaii ecumenical coalition on tourism, and a typology on racism and imperialism. Brief introductions to each of the essays bring them up to date and situate them in the native Hawaiian rights discussion.